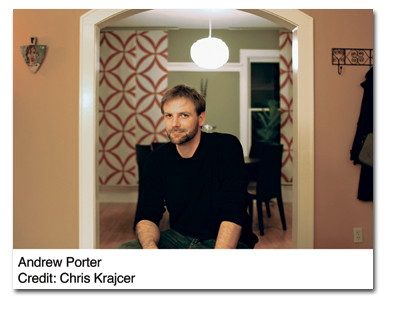 Andrew Porter teaches writing at Trinity University in San Antonio, Texas. 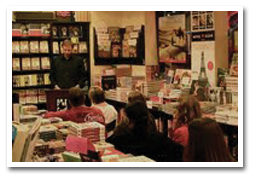 He is a graduate of the Iowa’s Writers’ Workshop and a winner of the Flannery O’Connor Award for Short Fiction. He is also the recipient of a Pushcart Prize and a James Michener/Copernicus Fellowship. Good morning, Andrew. Thank you for agreeing to participate in this interview with www.storyinliteraryfiction.com. It’s a pleasure to talk with you. Thank you very much. It’s a pleasure for me as well. I’d like to let our readers know about you. You’re in San Antonio, Texas as we speak. Were you born there? I moved here about six years ago. I grew up on the east coast but I moved down here to take a job at Trinity University where I currently teach. For college, I went to Vassar, and for graduate school, I went to the University of Iowa Writer’s Workshop. Were there special teachers at Iowa that had an influence on you? I had some wonderful teachers there. I studied with Marilynne Robinson, Frank Conroy, James Alan McPherson, and Barry Hannah. I’ve heard Frank Conroy was a pianist. Yes. He was a great jazz musician. I think he actually won a Grammy, from what I understand. Did you teach elsewhere before Trinity [University]? Actually, I taught for a number of years at various universities. A few in California, then several in Baltimore. I recently did an interview with David Lynn, who believes writers benefit from their experiences in life before beginning to write. What in your life prepared you for writing fiction? I wasn’t one of those people who had a ton of life experiences before I went to graduate school. I was only out of college for about a year before I entered graduate school, so I didn’t have a lot of life or work experience. [For me], my time at Iowa was probably the most influential time in terms of my development as a writer. Do you teach both creative writing and English? I have taught literature courses in the past, but now I teach fiction writing and the occasional nonfiction class. All at the college level? I occasionally will work with outside literary organizations. In San Antonio, I’ve taught with a program called Gemini Ink. With them, I’ve done manuscript consultation courses via email. How do you think about story today? What is the importance of story in culture and as an educational medium for society? And how do you see its importance as entertainment? What is the uniqueness of a literary story? I think the literary short story certainly has a lot more competition than it used to. But I also think there is something very unique about reading a literary story–a short story or any story for that matter. The primary difference [between the literary story and other stories] is that when you’re reading, you’re participating a lot more in the experience. For example, if you’re watching a movie, you’re being shown what the setting looks like, what the characters look like, and so forth. Whereas, if you’re reading a short story, you might be given some clues about what the characters look like or what the setting looks like, but you’re also participating in the imagining of the experience. I think that’s one of the reasons reading will always be popular. Does that also relate to interiorization, the movement of the reader into the minds of characters? The ability to know what a character is thinking is dramatically different than in a film for example, where the experience is almost totally visual. In movies, [we’re] being shown what the characters feel and sometimes even told how to feel ourselves, and certainly the images play a part in that. When you’re reading, on the other hand, you have to interpret these feelings for yourself. How does that affect your writing process? As you begin to write a literary story, how is the process adjusted [as compared to film] to get the reader engaged in that story? Well, I always think of John Gardner’s famous quote about creating a fictional dream in the reader’s mind. I think the first thing you need to do as a writer is convince the reader that what is happening is actually happening. You have to sort of draw them into the dream state. When I’m writing, I think first about creating a vivid and concrete imaginary world for the reader. Once you have that, [the dream] can then move forward. As you bring readers into that fictional dream . . . there are dangers that throw the reader out of the dream. I think it was Gardner, but maybe others, who talked about landmines that would explode in the prose and jerk the reader away from the story. Do you have any advice to share? This is one of the main things I talk about with my students because I think it is probably one of the biggest challenges for writers who are starting out . . . to avoid those moments where the dream of the story is disrupted. It can be as simple as forgetting to ground the reader in the setting. Or you might have a section break, and then, in the new section, forget to clarify the shift in narrative time. Or you might forget to clarify who’s speaking in a scene. Anything like that will jolt the reader out of the story. The example I always give is . . . I tell the students to imagine they’re watching a movie, and then to imagine the sound on the movie going off once or twice. If it was a great movie, you might leave the theater and not even remember this happened; but if this happened, say, ten times, as you left the theater, the only thing you would be talking about is how annoying the sound [disruption] was. Those breaks pull you out [of the story]. I talk to [my students] about that a lot. Is author intrusion one of those landmines . . . in the sense that the author steps in and brings the authorial world into the story world? I think it can be, especially if it is not established early on that the author is going to enter into the story. If the author steps into the story, say, three quarter of the way through, that can be very disruptive. How have your story ideas come to you? I’m sure it is a varied process. Typically, my stories start with an image, a memory from my past, or a place where I once lived, or a person I once knew, and in the initial stages, I’m just trying to write around that image. I think of it as sort of the soul of the story. Really, early on, I’m just trying to think about generating content, discovering who the characters are, what’s troubling them, what they want. My first drafts tend to be very long, sometimes sixty or seventy pages in length. I find I have to write a lot about the characters in order to get to the point where I really understand who they are and what the story is about. After that, I go back and give structure and form to what I’ve written. Are there elements essential to character development? For example, I would think a crucial element might be conflict in dialogue. Are there other elements, especially in the narrative telling, that you focus on to be sure the character develops in the mind of the reader? Sure. I think one of the things I try to do in that initial process is discover every aspect of the character’s life . . . I try to learn about their early childhood, their relationship with their parents, their relationship with their partner, how they feel about their job, and so forth. In doing this, I’ll often discover a lot of contradictions, and out of these contradictions come complexity. I’ve noticed you write frequently in the first person, especially in your book, The Theory of Light and Matter. . Why do you prefer the first person, and what type of story do you feel suits first person point of view? Well, I think I’ve always been drawn to the first person [because] largely I like the idea of assuming a persona as a writer, really getting myself into the mind of the character. And I also like the intimacy of it, and the fact that you have this ability to engage the reader emotionally when you’re writing in the first person. But one of my favorite [aspects] of the first person is that [it’s] an inherently unreliable point of view. I like to play around a lot with that unreliability. Everything that is being told to the reader is being told through a somewhat biased lens. And this allows the development of ironies, and the contradictions allow development of certain themes and meanings [that may not be available in third person]. Exactly. Often times there will be clear contradictions between what the narrator is telling you and what the narrator is actually doing and saying in the story. That always intrigues me. With a fondness for first person [POV], do you find that the closeness and intimacy at times may limit you because you can’t step back for distance from the action, you can’t get certain historical perspectives because of the limitations of what the first person can have experience of and know about the world at that story time. In contrast, the third person narrator can have more distance from the story action, but also [be] in perception of what might happen before and after. How do you deal with these limitations? How do you insert narrator information when in first person? Sure. I think the biggest challenge of working in the first person is the limitation of telling a story from just one perspective. I find that in a short story, it’s easier to manage, but when you’re working on something longer, like a novel, it can begin to feel almost claustrophobic. For example, I’m working on a novel right now. I initially planned to write this novel in the first person, but as I was working, I realized it was a much larger story, and that I would need to use an omniscient third person narration in order to tell it the way that I wanted to tell it. The use of the omniscient third person point of view really freed me up. That’s helpful. Thanks. Is the plot a discovery process for you, too, or do you think about plot before you start to write? I typically don’t think about plot at all until I get to the second draft of my story. I think about the first draft as the place for me to discover who the character is. The plot really grows out of character. The way I see it, the two are inextricably linked. So this is character-driven plot where the character enlightenment and change in thinking [is the raison d’être] for the plot? Yes. And I only discover the plot through discovering the character. Personally, I don’t like to have particularly elaborate plots. I want the readers to focus, particularly in a short story, on the character. You do have emotion in your stories. Something is happening. Something is going forward. And you do have ends. Do you think about endings and how they will function for you in your stories? Yes. I think endings are something that are either obvious to you as you are writing the story, or they’re not. For example, sometimes you may realize halfway through the story where you want the ending to fit; other times, the ending might become very difficult because you’ve written the story and you’ve come to a point where you have no idea how you want it to end. But I personally feel an ending should grow organically out of the story. It should feel somewhat surprising, and at the same time, inevitable. Of course, it is often hard to find that kind of moment. Do you think of stories as having some meaning, some enlightenment for the reader so he or she carries a new vision of the world away from the story? Right. On some level, I feel if there isn’t that type realization, or implied realization, at the end of the story, then I’m not sure why the story is being told. And that might be the major reason stories fail. The story is not told well or doesn’t have some purpose? Throughout the history of the story, are there stories you suggest for study? Well, I think the entire history of the story, particularly in America, is something young short story writers should be familiar with. When I was in college, I took a wonderful course on the history of the American short story. Unlike a lot of courses where you study a variety of short stories by a variety of writers, we focused on just one writer from each significant period in America [American literature]. We started out in the Romantic period and read Hawthorne. Then we moved on to Steven Crane, Hemingway, Flannery O’Connor, and then ended with a unit on contemporary short story writers. Having that experience gave me an enormous appreciation for the development of the American short story. You didn’t include Poe. Is he important in your mind? Oh, yes. Poe is someone any short story writer should be familiar with, as well. My advice would be to start at the beginning with writers like Poe, Washington Irving, Melville, and Hawthorne, then make your way forward, reading as many short story writers as you can from each period until you reach the people writing today. Are there differences between presenting a story orally and with presentation with the written word that are important [for writers] to identify? Being able to write a great story and being able to read a great story out loud are two very different types of skills. Some writers are good at both. Others aren’t. I’ve certainly heard some great writers read great stories in such a way that the experience was not very engaging for the audience, mainly because of the author’s delivery. I’ve also seen other writers whose stories weren’t particularly engaging on the page perform their stories in such a way that they were very engaging to listen to. I think those are very different skills. How important is this choice of story for reading? Are there characteristics of a story that make it better for reading out loud? Action? POV? Engagement? That’s something that all writers probably think about when they choose a story to read to an audience. If you’re reading at a loud bar on Friday night, you might want to pick something more humorous or lively. Whereas, if you’re reading to an audience in a large auditorium in a formal setting, you might choose a different type of story to read. I think all writers try to take these things into account when they choose a story. Is there a time limit when you begin to lose the audience’s attention span? I think anything over twenty minutes is pushing it for a lot of audiences. Of course, this sometimes makes it difficult to read an entire short story. But I’ve always felt it’s better to leave them wanting more than to go on too long. Exactly. I think it’s better to end on a cliffhanger. I want to emphasize you’re the winner of the 2007 Flannery O’Connor Award. The Theory Light and Matter. That was published by the University of Georgia Press. Happily, that is to be republished in January of 2010 as a Vintage paperback. And you’re working on a novel. When will that be finished? When will it be published? My goal is to have the novel finished by next January. Then it would probably be coming out the following year. 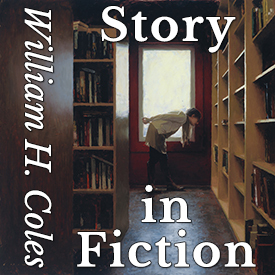 Do you have another collection of short stories? Yes. I have a number of other stories in the works. I hope to publish another short story collection at some point in the future. We’ll look forward to that. Do you think the literary prose story is declining in popularity? I actually don’t. I think, if anything, it’s thriving . . . despite what people say. As far as I can tell, submissions to literary magazines are at a record high. And there are probably more literary magazines out there now–if you consider online publications–than ever before. Certainly there are more MFA programs and more students applying to those programs, and presumably these are people who are reading and writing short stories. So I think the form is very much alive and thriving. I do think the publishing industry has changed. Major publishing companies are no longer publishing as many short story collections as they used to. 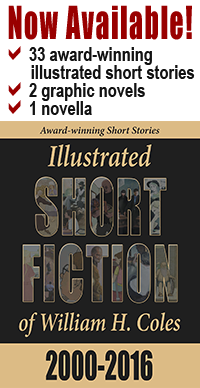 So, instead, readers are turning to independent and university presses to find short stories. The market may have changed, but it still exists, and there is still a lot of very exciting short fiction being written today. Do you like to read online? Would you read a collection of stories online, for example? That looks like the direction we’re going in. I tend to find it a little difficult to read online only because my eyes get tired when I look at a computer screen too long. But certainly a lot of the best fiction out there is being published online. Is Kindle easier to read? I’ve never actually read anything on a Kindle. Do you publish online now? I actually had my first story accepted by an online publication, which is very exciting. For a lot of years, I’d been hesitant to submit stories to online publications, mainly because there were so many of them out there and it was hard to know which ones were quality publications, or which ones would still be around in six months. But I think, now, things have changed. They are a lot more established [online] publications. If someone wanted to take courses from you, are there opportunities available? Matriculated courses? As I say, I occasionally teach a manuscript consultation course with Gemini Ink. I plan to teach at the Iowa Summer Writing Festival in the future — not this summer, but the following summer. Certainly, at other summer conferences and online. I allow employees of the university to audit my classes. But generally not others because the waiting lists are so long to take fiction-writing classes. So, I tend to give preference to students and employees of the school. Do you have a website that will list your readings and lectures, especially after your book comes out? Sure. andrewporterwriter.com That lists all upcoming events and articles. This has been a terrific and worthwhile time for me. I’ve enjoyed talking with you. Thank you very much. Well, it’s been a pleasure for me, as well. Thank you.